The 1920s – a golden age of glitz, glamour and Gatsby. A period of great social upheaval, it was the decade where people really began to let their hair down and party. 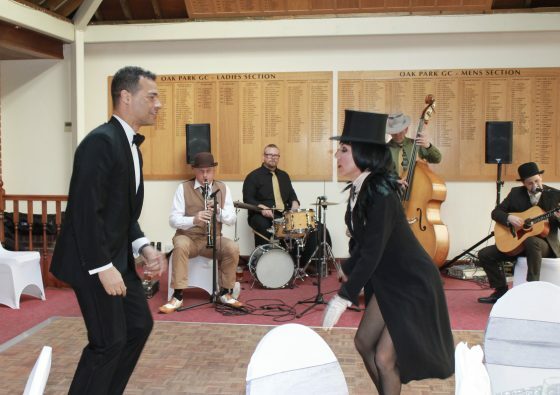 Almost a century on, and with themed parties or events increasingly popular, the 1920s is understandably a popular choice for party and event planners and we have the 1920s band for hire, just for you! But why is the 1920s so popular? Well, it’s that ‘glitz, glamour and Gatsby’ again, of course. We could spend this entire post explaining what is so great about the era. In fact, we could write an entire book on it – and many people have! From the liberating carefree attitude of 1920s flappers girls to the whiskey-soaked underground appeal of the speakeasies, the prohibition era has so much to talk and write about. The answer to that all-important question is an unequivocal and resounding YES! As you can see, there’s a lot of dancing, shimmying and a hotsy-totsy good time seems to be being had by one and all! 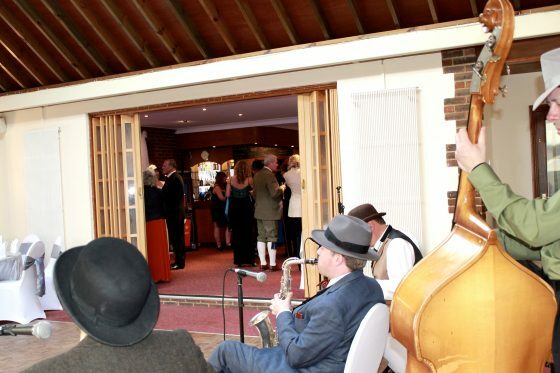 THAT is what your wedding, party or corporate event could be like if you choose The Jazz Spivs as your 1920s band for hire – the best band on the British Boardwalk, to provide the live entertainment. It doesn’t really matter how far you want to go with the 1920s theme. You could take the ‘whole hog’ approach of a grand Great Gatsby evening or a Gatsby-inspired wedding, with décor to match. You could recreate the ambience of the speakeasy – even having a dress code to suit, such as gangsters and their molls. Equally, you might just want to see your guests have a great time. With a 1920s band for hire, this is guaranteed. If you want to see your guests letting their hair down and spending most of the night on the dancefloor, there really is nothing better. Get in touch today and get your guests on the dancefloor!